This volume is a collection of articles that critically examine the efficacy, ethics, and impact of the War on Terror as it has evolved since 9/11. During the decade and a half of the Global War on Terror (GWOT), numerous books have considered the political, psychosocial, and economic impacts of terrorism. However, there has been little systematic effort to examine the effectiveness of the GWOT in achieving its goals. Furthermore, there is virtually nothing that presents a comparative analysis of the GWOT by the people most directly affected by it—citizens and scholars from conflict zones in the Middle East. There is, therefore, great need for a book that analyzes the strategies, tactics, and outcomes of the GWOT and that also presents facts and ideas that are missing or underrepresented in the dominant public narratives. The contributions in this volume were chosen to specifically address this need. 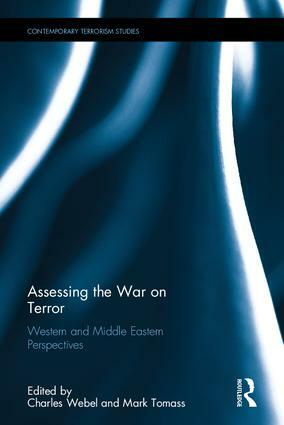 In doing so, it uniquely provides not only Western perspectives of the GWOT, but also importantly includes perspectives from the Middle East and those most directly affected by it, including contributions from scholars and policy makers. Overall, the contributions demonstrate how views differ based on geographical location, and how views have changed during the course of the still-evolving War on Terror. The book will be of much interest to students and scholars of terrorism and counter-terrorism, foreign policy, Middle Eastern politics, security studies and IR, as well as policy makers. Charles Webel is the Delp-Wilkinson Chair and Professor of Peace Studies at Chapman University, USA, and Professor of International Economic Relations at the University of New York in Prague, Czech Republic. He is author/editor of eights books, including Terror, Terrorism, and the Human Condition (2007) and Peace and Conflict Studies, 3rd edition (with D. Barash, 2014). Mark Tomass is an economist and instructor at Harvard University, USA, and author of The Religious Roots of the Syrian Conflict: The Remaking of the Fertile Crescent (2016). Contributors: Noam Chomsky, Oliver Richmond, Ioannis Tellidis, Sarton Weinraub, Buthaina Shaaban, Anwar Said al-Haidari, Sher M. Khan, John Arnaldi, William Cohn, Laurie Calhoun, Scott Atran, Johan Galtung, Casey Douglas Carr and Audrey Kurth Cronin.